Despite the Bush Administration's plan to provide $20 billion worth of advanced weapons to Saudi Arabia and Secretary of State Condoleezza Rice's latest visit there to reiterate common purpose on Iraq, Iran and the Israeli-Palestinian conflict, relations between Washington and Riyadh are troubled. The two countries still share the same goals, but the Saudis are hanging tough on issues where they believe the current U.S. Administration, with only 18 months left in office, is pursuing policies that are unlikely to achieve those shared goals. 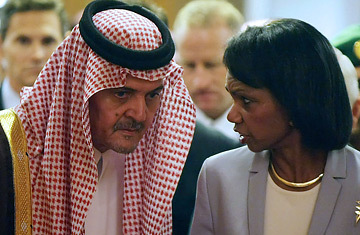 Even the show of unity Wednesday between Saudi foreign minister Prince Saud al-Faisal and Secretary Rice could not hide the differences: The Saudis vowed only to "consider" opening full diplomatic relations with the Iraqi government, for example, and while they backed the Bush Administration's plan to hold a Middle East peace conference in the fall, the Saudis declined to indicate that they would attend such an event, and made clear their participation would come only when Israel was ready to discuss the "final status" issues that it wants deferred. Washington and Riyadh are clearly at odds on two of the Administration's major current Middle East policy ventures  Iraq and the Palestinians. Former U.S. Ambassador to Baghdad Zalmay Khalilzad last week accused the Saudis of undermining the Iraqi government, while the New York Times reported that even as Washington urges the Saudis to do more to support the government of Iraqi Prime Minister Nouri al-Maliki, Riyadh has been actively lobbying the U.S. against Maliki, warning that he is a cat's paw for Iran and in cahoots with the very sectarian militias the U.S. claims to be fighting. On the Palestinian issue, the Saudis earlier this year confounded U.S. efforts to isolate Hamas by persuading President Mahmoud Abbas to join a unity government with the Islamists. And even now that the unity government has collapsed and the U.S. is working to bolster support for Abbas against Hamas, the Saudis maintain that the idea of seeking a peace deal with Israel that excludes Hamas is shortsighted and unworkable. Even as Washington warns Abbas against any return to a unity government, the Saudis continue to urge Abbas to reconcile with Hamas. Even on Iran, whose growing influence in the region is deeply threatening to the Saudis, Riyadh differs sharply from those hawks in the Bush Administration who advocate isolation of Iran and confrontation to resolve the nuclear issue. Riyadh made a show of hosting Iranian President Mahmoud Ahmedinajad for talks late last year at a time when Washington was pushing for maximum isolation of Tehran. The arms deal and Rice's latest visit are intended to bolster Arab support for the U.S. on the subject of Iran, as well as to gather momentum for a regional peace conference Washington wants to stage on the sidelines of the U.N. General Assembly in September. On both fronts, the Saudis are unconvinced by U.S. efforts. And with the U.S. presidential election season already under way, expect the proposed arms deal to get a rough ride in the media in the coming weeks, as pro-Israel hawks denounce the very idea of supplying the desert kingdom with advanced weapons, casting aspersions on the Saudis' commitment to fighting terrorism and warning that the regime is so weak that such weapons could fall into the hands of extremists. But despite these visible differences on key Mideast policy issues, the Saudis have not broken with the U.S. any more than Britain has done since it chose a new leadership less sanguine about U.S. foreign policy. The U.S. remains Saudi Arabia's most important strategic ally, and that relationship has been a cornerstone of U.S. national security doctrine since 1945. Even on the issues where they differ, the two sides share the same strategic goals  stabilizing Iraq; concluding a peace deal between Israel and the Palestinians; and curbing Iran's regional influence and nuclear ambitions. The differences arise because the Saudis believe the Bush Administration's methods of pursuing these goals have failed, and that its dogged persistence in pursuing dysfunctional policies will imperil both Saudi and U.S. strategic interests. The Saudis also know that President George W. Bush is a lame duck and have to work with that debilitating circumstance. They saw his father as a model U.S. President, and are quite disappointed because he was so unlike his father. So, the Saudis will emphasize their shared goals with the U.S., but they won't follow the Bush Administration's lead on the key issues when Washington's policy contradicts their own sense of what is required. They will strongly support the continued U.S. presence in Iraq, but press for more aggressive pressure on the Maliki government to make substantial political concessions to Iraq's Sunnis; they will continue to promote Palestinian unity and insist on a more far-reaching Mideast peace process than the one envisaged by the Bush Administration; and they will continue to press for a realistic diplomatic solution to the Iran nuclear standoff. And, of course, they will hope that the U.S. electorate produces a successor more prone to the realism of the elder Bush than to the hubris and ideological impulses of his son.